The Enterprise is diverted to a sector of space that lies beyond their currently explored territory. The Vega IX deep space probe has discovered a space-borne organism of great power, nicknamed "Tin Man," with whom Starfleet wants to make contact. In order to facilitate such contact, mission specialist Tam Elbrun, an unstable but gifted Betazoid, is sent along. Will the Enterprise be able to beat the Romulans to Tin Man, and can they trust Tam Elbrun to do the right thing when they get there? Tam prepares to dazzle the crew with one of his lesser known Betazoid abilities. Matthew: Tin Man has some things going for it, some against it. In the "pro" column, this story is written by two sci fi veterans. Apparently, they were both inspired and appalled by the sheer awfulness of "Samaritan Snare," and resolved to adapt their story about a space dwelling organism to Trek. So this episode has a nice sense of wonder and some relatively deep ideas to its credit. It was really nice how Picard expressed wonderment at Tin Man's existence. The way Tam Elbrun described Tin Man's loneliness was very evocative. So the conceptual content was strong. Any time they talk about extra-galactic beings, my sci-fi hackles tingle just a bit. Kevin: Yeah, on paper, this is an awesome episode. I particularly liked the emotional angles of the show. They may not get the full development they should, but what is there is pretty good. I like the fleshing out of Betazoid telepathy. I also liked the crew dynamic a lot this episode. The scenes of Picard and Troi discussing how to proceed came off really well. He was treating Troi like the professional she is in the field in which she is a professional, and that's always nice. Matthew: In the con column were the under-baked Romulan plot and the fact that Tam Elbrun wasn't as interesting as he could have been. A "space race" of sorts is potentially very exciting. But it would have been more exciting and interesting if, for one thing, Tin Man actually promised some great boon to the winner. So what if you find a giant space whale first? If they had shown Tin Man destroying a star or something similarly impressive, that would have motivated the rush to reach it. It seems arbitrary as it stands. Then, Tam Elbrun was also a bit under-done. They talk about betazoid telepathy developing in adolescence (that must be fun...), but don't really give us any new Deanna back story. They talk about Deanna counseling him, but don't give us enough detail from that. 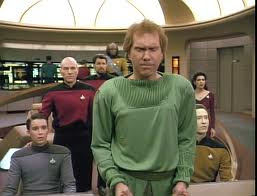 They have Riker all honked off about the Ghorusda disaster, but we don't find out how that all went down. His friendship with Data was supposed to be deep or something, but really was just tacked on, and probably got in the way of the rest of the story time-wise. The notion of the character was interesting. The execution in writing him lacked follow-through.On the plus side, I did enjoy his dialogue reading the crew's thoughts. It was more enjoyable than the same type of stuff with Lwaxana, because it was trustworthy and illuminating, instead of just being played for laughs. Kevin: There really must be no doctor-patient confidentiality in the future. I might understand if they were both Starfleet officers when the counselling took place, but they were both civilians, and I know I'm applying modern legal standards to a fictional universe, but things like this bother me. As for the discussion of Betazoid telepathy, it's almost there for me. I'm always happy when the idea of mind reading is seen as a complicated, almost identity-consuming job rather than merely reading the stock-ticker in someone's brain. Actually sensing the cacophony of someone else's thoughts would be quite draining, especially for a child who hasn't carved out his own identity yet. I would have liked them to take it a bit farther. If Tam could sense other people's emotions when he was too young, maybe he would have trouble separating his own out from theirs, like a form of multiple personalities; Tam could start to become whoever he is sensing. They'll visit that (in a much sexier way) with Kamala in Perfect Mate. Matthew: I had some questions. How did the light from the star's collapse travel 3.8 billion km instantly? That should take a good 3 or 4 hours, yet only a few seconds passed after the Enterprise was thrown clear and the image of the nova was on the viewscreen. Won't Tam Elbrun get lonely with just a weird space worm for company? It seems like he enjoys at least Troi's company, and his new found friendship with Data belies the notion that he wants to get away from all humanoid life. He enjoyed the Chandrans' "glacial minds," too. I also want to know how telepathy is supposed to work. Does it travel at faster than light speeds, too? If so, what explains the reason why Betazoids have it as a race, while humans don't? It seems an inherently physical attribute, yet it seems to violate the laws of physics. Kevin: I like to think they roam the galaxy having new adventures. As for telepathy, all I really ask is consistency. I accept FTL engines; I can accept telepathy. It just has to have some boundaries that are stuck too. Sometimes Troi can sense anything that might vaguely qualify as life on a philosophical level. It does seem to be a physical phenomenon given she doesn't need line-of-sight on a person she's reading. As for the time factor, maybe thoughts propagate in subspace. My only other question is that Data says quite clearly that there is no known natural phenomenon that can travel at warp. That means Gomtuu and his crew were travelling at sublight speeds through intergalactic space. I would have liked some explanation about the scale of their lifespans or something. Matthew: I got the impression that Gomtuu could indeed travel at warp speeds. It seemed to me Data was implying that no known phenomenon yet discovered could travel at warp. Matthew: Harry Groener was pretty good as Tam Elbrun. The way he played the role made the writing shortcomings all the more acute. I wanted to learn about him, but wasn't really allowed to. He played "harried" well, and his snappy line readings when he was telling the crew their thoughts were quite enjoyable. He looked... unfortunate... in the costume, though. Kevin: Buffy fans may recognize Groener as The Mayor from Seasons 2 and 3 of Buffy the Vampire Slayer. I loved him in that role and I think he's a really good actor, so it's sad the material wasn't quite there. He did the best with what he had though. I liked him yelling at Riker, and his scenes describing Tin Man's pain were quite moving. Matthew: Sirtis got some nice scenes with Groener. She slipped between good friend and good counselor. I would have liked one scene where she counselled Riker, though. He seemed to have issues with Elbrun. She could have either helped him through his issues, or stuck up for Tam. Kevin: I think Picard and Data's scenes with him were good as well. The scene in Sick Bay where Picard admits to not trusting him was a great scene all around. Everyone had interesting and credible reactions to what was going on. I also really liked the last scene with Data and Troi. I like any time the writers can give characters on such opposite ends of the emotional spectrum a really good scene together. Matthew: There were some really neat space effects in this one. The force field effects generated from Tin Man were neat looking, sort of a glowing expando-donut. The "gomtuu" idea was a bit reminiscent of the Star Trek 4 probe, but they made it look like an interesting glowing pine cone of a ship. And we even got a bit of space battling with the Romulans. So that was nice. Kevin: The donut was an edited reuse of the last explosion effect from TMP, but Memory Alpha had to tell me that, which given that I didn't know that, but really liked it is a credit to their editing skills. I liked the Tin Man design. It felt organic. The hull looked like an insect carapace. The silly putty interior was less good, but still good effort overall. Matthew: Tam Elbrun's costume was really, really unfortunate. It wouldn't have looked good with a burly actor, but with such a slight actor with feathery hair occupying all that rouching and scalloping, the effect was overwhelmingly effeminate. This kind of distracted from the character and the actual reason for his alienation. I just felt like he got beat up as a kid for dressing like a sissy. Kevin: Where we criticized Theiss for going to far with shiny, synthetic materials, this is Blackman going too far with extured, natural fibers. It's also really washed out. Take it from a pale Irishman: we can rock jewel tones like nobody's business. Matthew: As much as I've harped on this one, I think it's a 3. I think the nugget of a good story is there, and the acting was hampered only by the deficiencies of the script. Had they cut a subplot and gone deeper with either main element (the space race or Tam Elbrun), it might have hit a 4. Kevin: I'm going with the 3 as well. The one too many plotlines make the episode a little talky and dragging, but some top notch guest acting and some neat effects land this in squarely in average territory. That makes a total of 6. This one is a real looker in HD. The space shots with the Tin Man model, the star, and the Romulans, look superb, definitely movie quality.